Imagine going in for a routine surgery and waking up as a quadruple amputee, fighting for your life. This nightmare was a reality for Annette. Instantly, the dedicated wife, employee and mother was completely dependent on others for every part of daily living. That is, until Canine Companions Service Dog Patch entered the picture. 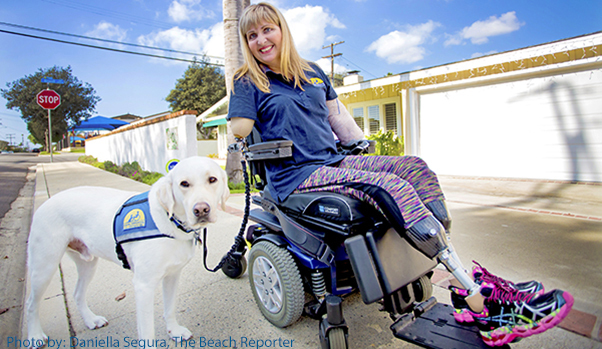 Annette was partnered with Canine Companions Service Dog Patch in August 2016, just days after her birthday. “He is the best present I have ever received,” she says. Assistance dogs like Patch are being recognized this week during International Assistance Dog Week for the devotion and services they provide people with disabilities like Annette. The week not only acknowledges the heroic deeds of assistance dogs, but also the countless volunteer puppy raisers and professional trainers who make these matches possible. Read our full press release. Your opinion matters, and there are cute puppy pictures involved! Tell us which picture you think should be the 2018 Canine Companions puppy calendar cover. Vote today and pre-order your calendar for only $25. Voting ends August 15. Now through Sunday, August 13, Dutton-Goldfield Winery is helping celebrate International Assistance Dog Week by donating 10% of all online wine sales to Canine Companions when you enter code “canine” in your order comments. Visit duttongoldfield.com. Cheers! The 6th annual TEAM Volunteer Leadership Conference was a huge success this year! Our newest region, South Central, hosted over 240 Canine Companions volunteers and staff. Not yet a volunteer? Become one today! Foley's first flight. Read about his adventure. Learn how a charitable gift annuity can provide you with fixed payments for life. Grab a leash and join the fun! Jam City and Peanuts Worldwide Team Lend a Helping Paw. Get a free hat when you spend $40 or more at our online gift shop. Use promo code 1124 for white, 1126 for brown and 1125 for pink. Offer ends 8/31/17.